OXFORD, Miss. 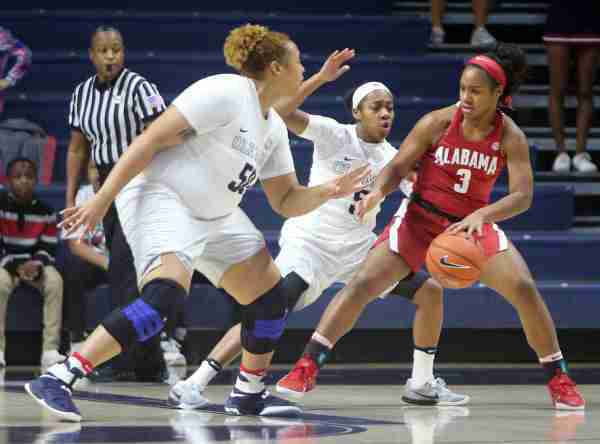 – After the Rebels’ 65-57 loss to Alabama last Sunday, head coach Matt Insell quickly gave credit to his opponent for its victory, which snapped the Tide’s three-game losing streak. Insell also praised Alabama head coach Kristy Curry for the toughness of her team. Now, he is looking for his team to flex its muscle against Kentucky (15-5, 2-4 Southeastern Conference) tonight in Lexington. Overall last Sunday afternoon, the Rebels (13-7, 2-5 SEC), who looked somewhat out of sync on both ends of the court, still had opportunities to take over a game against a team that committed 30 turnovers, which led to 21 points for Ole Miss. The Rebels committed 19 turnovers that led to 14 points for Alabama. Crimson Tide freshman guard Jordan Lewis scored a game-high 22 points on 6 of 11 shooting, finding success whether she was taking a 17-foot jump shot or driving to the lane for either a floater or a layup. She also made herself comfortable at the free throw line, making 10 of 14 shots. As a team, the Crimson Tide (15-5, 3-4) made 21 of 44 shots from the field, including 6 of 11 from deep. When the Rebels had trouble limiting Alabama’s offense, Ole Miss looked to its offense own for a spark. Madinah Muhammad scored a team-high 18 points, including the team’s only two made 3s of the game. Taylor Manuel added 13 for the Rebels, but had to be cautious of her movement while playing with four fouls. The St. Louis, Missouri native picked up her fourth foul at the 6:03 mark of the third quarter when the game was still in striking distance, with Ole Miss trailing only by four at 32-28. Shandricka Sessom tallied 11 points, but fouled out at the 2:40 mark of the fourth, with the Rebels down 56-53. With only nine league games remaining before the SEC Women’s Basketball Tournament starts on March 1 in Greenville, South Carolina, Ole Miss needs to find its rhythm. Coach Insell spoke with his team after the Alabama game, urging them to get tougher, because he knows they’ve got what it takes to win in the SEC. The Rebels travel to Kentucky tonight (6:00 pm CT SECN+). They’ve beaten the Wildcats two out of the last three meetings, with both wins coming in Oxford. Kentucky leads the series 21-17. As for Coach Insell, he is confident his team can bounce back and is ready for the game with the Wildcats. He posted the following tweets today, indicating he expects his team to be ready. Ole Miss: The Rebels are now 12-1 at home this season, snapping their longest home winning streak of 12 games in the Insell era, which was the most since Ole Miss strung together 15 consecutive home wins in the late 80s. Before Sunday, the Rebels’ last home loss was against No. 3 South Carolina last February.